Live Security Platinum is a rogue security product from the Winwebsec family. It's currently one of the most active malware families on the net. The distribution model used to promite this rogue anti-spyware program has not changed over that last few months: spam emails, hacked websites and fake online virus scanners. Spam on popular social networks can be also taken into account, even though, they do all they can to prevent spam, it still exists. 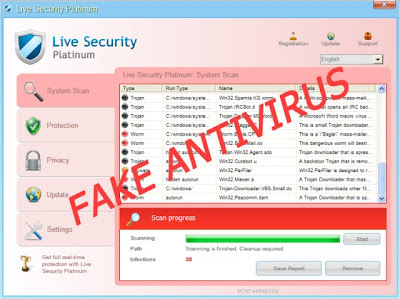 Announcing about these viruses, Live Security Platinum seeks to sell its commercial version. Live Security Platinum may also use browser hijackers to implement successful redirections to its malicious websites. There, people not only purchase a totally useless and dangerous application but also give for the scammers their credit card details. Just like the false scan results, these security alerts are just another trick being used to make you pay for bogus software. You shouldn't purchase this fake program, remove Live Security Platinum upon discovery. As you can see, Live Security Platinum is nothing more but a scam. If you have already purchased Live Security Platinum, then we suggest that you contact your credit card company and dispute the charges. Then you should get rid of the rogue anti-spyware program on your computer as soon as possible. We strongly recommend you to scan your PC with at least one legitimate and reliable anti-spyware program, such as Spyware Doctor or SpyHunter as manula removal process requires a lot of knowledge of system architecture. 1. download Spyhunter. This program has free killer of malicious processes. It is designed to run even when it is blocked. Try to change the name from .com to .exe or otherwise. 64C665BE-4DE7-423B-A6B6-BC0172B25DF2. It will look like you purchased it. 3. Kill the malicious process and delete Live Security Platinum with the upgraded version of Spyhunter.